Samuel Clifford and Thomas Nevin shared a long friendship and partnership from the 1860s until Clifford’s death in 1890. 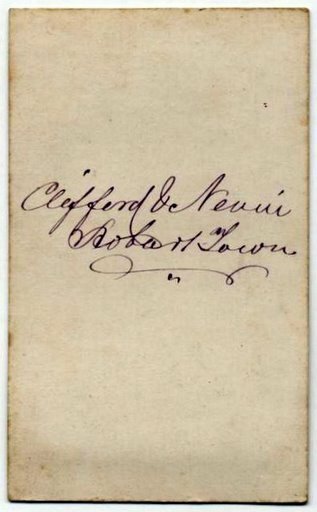 Several private client cartes exist with the inscription on verso “Clifford & Nevin Hobart Town“. Below is an example of the same photograph printed twice, once as a single image, the other as a stereograph.The black and white copy is dated 1869 and held at the Archives Office of Tasmania with attribution to Samuel Clifford. The stereograph (double image) is held at the Tasmanian Museum and Art Gallery, and carries the impress of T. Nevin on mount. 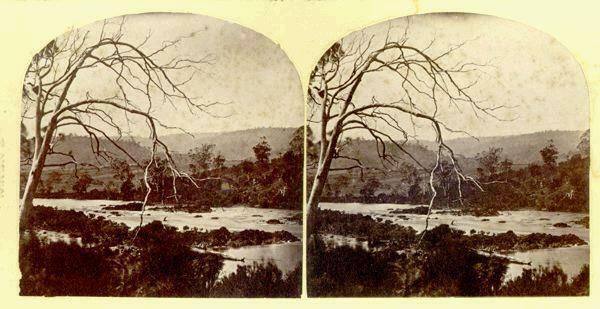 Thomas Nevin’s standard stereograph views included these photographs taken in the upper Derwent Valley ca. 1870. DESCRIPTION : Scene near New Norfolk ? 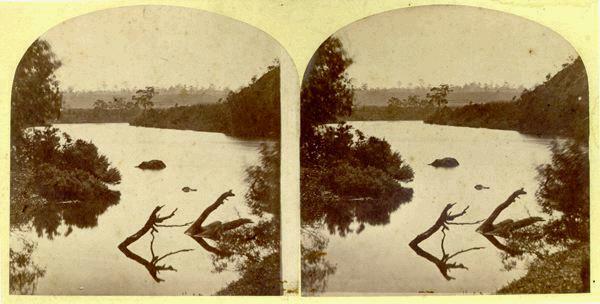 This stereograph by Thomas Nevin, titled Salmon Ponds, at Plenty near New Norfolk, ca. 1870, which is held by the Tasmanian Museum and Art Gallery is very similar to one by Samuel Clifford. Several views of the upper reaches of the Derwent were taken by Nevin, and copied by Clifford. 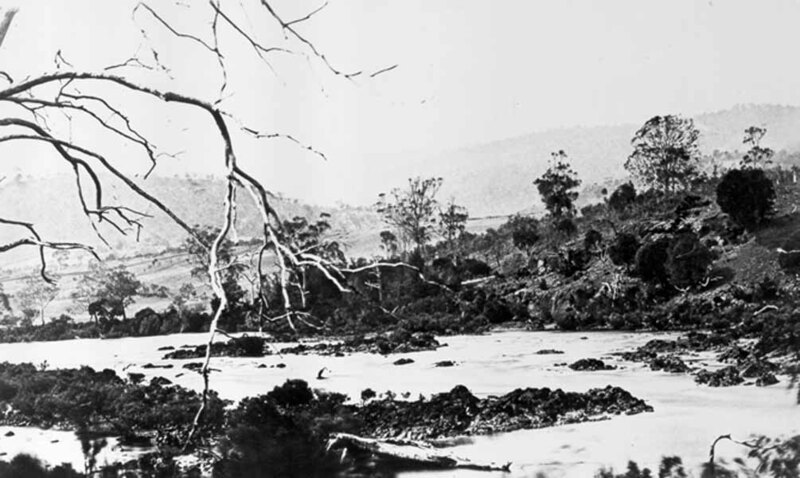 The TMAG has another stereo titled Junction of Plenty and Derwent Rivers, Ref: Q1994.56.14, (below) which belongs in this series, at present unattributed. It is likely to be one of Nevin’s, and many more stereographs which have a Clifford attribution in public collections are likely to be reprints of Nevin’s negatives. 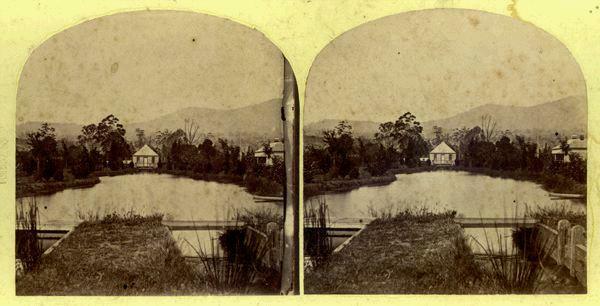 The State Library of Tasmania holds dozens of stereographs in a Clifford Album which include Clifford’s reprints of Nevin’s work around Port Arthur 1871-3. Thomas Nevin and Samuel Clifford were close friends and colleagues over a period dating from ca. 1865 to Clifford’s death in 1890. A group photograph of Thomas and Elizabeth Nevin, seated, with Thomas’ younger brother Constable John (Jack) Nevin extreme right standing next to a man who was probably Samuel Clifford, could have been taken on the eve of Nevin’s full-time appointment to the civil service, January 1876. At some point during their long relationship, these two photographers signed the verso of several studio portraits “Clifford & Nevin, Hobart Town“, extant examples of which are held in private collections and at the Queen Victoria Museum and Art Gallery. It is likely that they printed these scenes for the local and interstate tourist trade, sharing their stock of negatives and prints from as early as 1865, and that “authorship” was secondary to the successful turnover of the commercial product. Many of Nevin’s negatives were acquired and reprinted by Clifford in 1876 when Nevin sublet one of his studios, the former studio of Alfred Bock at 140 Elizabeth St, Hobart, to assume full-time employment with the Municipal Council and Police Office at the Hobart Town Hall. 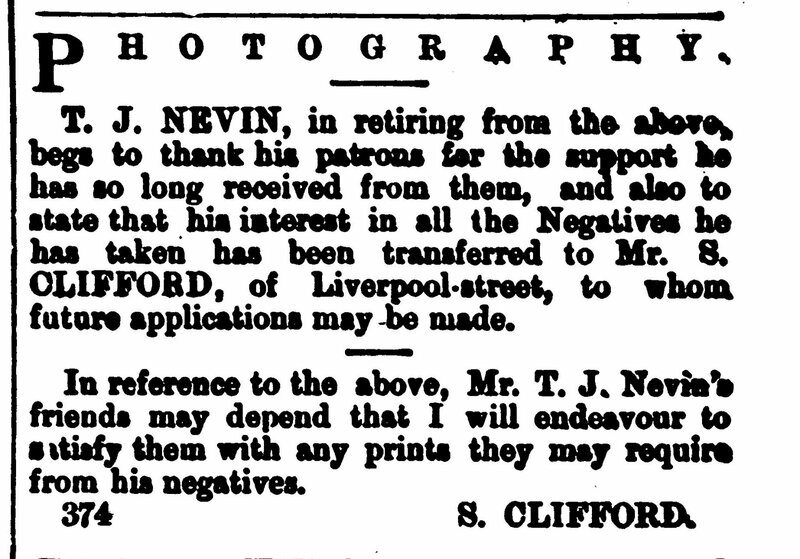 T.J. NEVIN, in retiring from the above, begs to thank his patrons for the support he has so long received from them, and also to state that his interest in all the Negatives he has taken has been transferred to Mr S. CLIFFORD, of Liverpool-street, to whom future applications may be made. 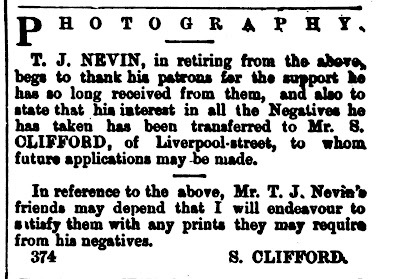 In reference to the above, Mr T.J. Nevin’s friends may depend that I will endeavour to satisfy them with any prints they may require from his negatives. The reason for this advertisement was to underscore Nevin’s status as a full-time civil servant which was announced later in January 1876. As a civil servant, he was not entitled to further remuneration – “interest” as it is termed here – from his commercial photography. However, he was not long retired from commercial practice when he was called on again to do photographic work for the Municipal Police Office, located at the Town Hall, with duties as well at the Hobart Gaol. His earlier work for the Colonial Government on commission was to photograph prisoners on transfer, reconviction, and discharge from the prison system. And by 1880, he was producing commercial work once more with Henry Hall Baily, another close friend while still a civil servant at the Town Hall, a fact noted by The Mercury, December 4th, 1880.